Poet's Notes: I cannot imagine filming a nature documentary, silent witness to the struggle between hunter and prey, unable to intervene, hunger or death awaiting the loser. As a biology major, I try to be dispassionate about the food web unless I witness it personally. Such an encounter led to this poem. Curiosity made me keep checking the nest. No bird ever sat on the two eggs, and after several days they disappeared. I can only hope they fed something else since they had no chance of survival. 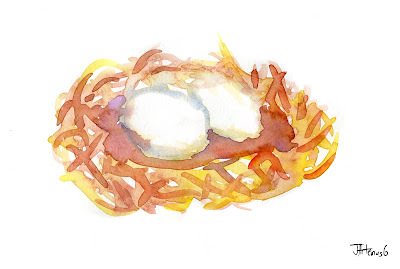 Editor’s Note: Taken literally, this poem is a poignant example of biology/ecology at work with a nice, positive spin about the hope that some benefit to some other of Nature's creatures was derived from the disaster to the poor bird and eggs. However, taken metaphorically, the poem makes an important statement about what happens to families when the parents desert them. As I read Lauren’s poem, I was immediately reminded of a poetic essay in the most recent chapbook offering from Rattle: "Punishment" by Nancy Miller Gomez. In "How Poetry Saved My Life, Part One," Gomez writes about a prisoner in a maximum-security prison who was part of a poetry seminar for prisoners she was teaching. The prisoner (probably a murderer or some other violent felon) recited a poem to the group about when his mother drove him, then 8, and his sister, then 4, to the grocery store and left them in the car saying she'd be right back. She never came back. Ever. And that woman's son grew up to be a convicted felon--essentially dead to society. Eggs abandoned. Family ruined. And there is really no way to put a positive spin on that.